Melrose style has come to the 818 in the form of Timeless — a hip and budget friendly women’s clothing boutique in the heart of Studio City. Fashionable and funky, this is the third location for the seven-year-old Timeless which has two other locations in West Hollywood. Stella Shin, the creative brains behind Timeless, studied fashion in Paris. The opening of the newest location on Ventura Boulevard has already gained celebrity clients such as Jennifer Love Hewitt and Kyle Richards from The Real Housewives of Beverly Hills, as well as your local shopaholic (myself included). 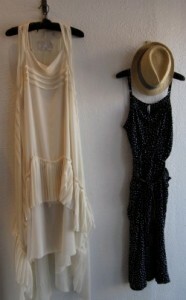 Timeless is stocked with flirty ruffled pieces, long jumpers, short and long dresses, striped tunics, flowy and fitted tops, as well as their signature shirts which are designed by Z. Hovak, whose Chanel inspired designs are one-of-a-kind, with customization that re-vamps any standard t-shirt. Timeless is also budget friendly. The highest priced item is $128. Tops, which you can pair with a multitude of outfits, range from $28 to $52. You will find yourself in a fashion frenzy looking at the floral prints, stripes, skulls and bold colors that engulf this whimsical store. 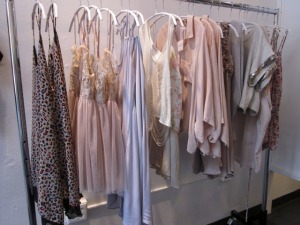 Clothes are organized into similar color palettes, making it easy to browse among all the alluring options. The long and flowy beachy dresses can go from day to night, with the simple touch of a nice denim jacket for day, or a structured blazer for night. They also carry accessories, such as simple totes, colorful belts and scarves, most which are the perfect complement to any outfit. While the Melrose and Studio City stores carry some of the same items, the Valley location has more casual and relaxed pieces, while Melrose has more evening pieces and bolder, structured options—perfect for any woman who needs an outfit for a big night out. Timeless caters to all demographics, whether you’re a trendy Mom on-the-go or a college student looking for casual daytime wear. They receive new shipments every Tuesday and Friday, which keeps the store looking new and vibrant. There’s something for everyone in this budget friendly, fashion forward and local boutique. I guarantee you won’t leave empty handed. Timeless Boutique is my new fashion love affair and it doesn’t have to be a secret.